About 50 miles from nowhere and four hours to daybreak, I squinted through the steep windshield into a soup of sand and fumes while our 2018 Toyota 4Runner TRD Off-Road Premium plowed across open desert. We were hunting the horizon for adventure or trouble and rest assured, this truck loves to find both. Every year I get fired up to haul myself three hours east of Los Angeles to a hostile wasteland called Johnson Valley to check out The King Of The Hammers. That’s a week-long off-road racing festival culminating in a title event by the same name. That last race is a tentpole of the Ultra4 series; I usually describe Ultra4 cars as “Jeeps on steroids” but they’re really just enormous V8-powered buggies on tires sized at 40 inches and up. Every year I think I’m going to do some motorsports journalism, closely follow the whole race and talk to competitors. And every year I never manage to get that done because I have way too much fun partying with other off-road enthusiasts and driving around the desert like a lunatic. This year was wilder than most, because I had the capable and comfortable 4Runner shake down. And like I said to start–you’d be hard-pressed to find a more willing four-wheeled adventure buddy than this SUV. Toyota was onto the idea of mass-appeal sport utility vehicles early on. In the mid 1980s, the Land Cruiser had already been an overland institution for decades. But somebody at the company had the bright idea of putting a cap and some extra seats on a pickup truck to make an inexpensive, user-friendly version of an off-road station wagon... and the O.G. 4Runner was born. The first generation trucks were pretty much just Hilux pickups with a longer, detachable rear section of roof. Then in 1990 the 4Runner became more civilized but remained purpose-built around adventure and having fun. It gave a double meaning to the “sport” in “sport utility”, so to speak. The 4Runner’s sales pitch has been the same ever since, and at the end of 2009 the world was introduced to the angular, angry-looking fifth generation we have today. This particular variant, the TRD Off-Road Premium, is supposed to be a willing partner in off-road escapades but not quite as aggressive as the TRD Pro which features a softer, more resilient suspension setup and some decorations. All 2018 4Runners are powered by a 4.0-liter V6 that, according to Toyota, makes 270 horsepower and 278 lb-ft of torque. That mill is mated to an old-school five-speed automatic transmission with a transfer case to lock into 4WD and low-range. The luxury-spec Limited gets automatic 4WD engagement with a knob, which is obviously not as cool. The 4Runner is 75.8 inches wide and 191.3 inches long with a 109.8-inch wheelbase, making it substantial but not enormous by modern SUV standards. A new Jeep Wrangler four-door measures 188.2 inches long with a 118.4-inch wheelbase. Toyota claims a 4,750 pound curb weight for the 4Runner. Meanwhile, a Land Cruiser is about four inches longer and, can you believe it, over 1,000 pounds heavier. That explains why this truck feels a lot more spry, even though it’s down more than 100 horsepower. With a track width of 63.2 inches, the 4Runner is pretty maneuverable. 9.6 inches of ground clearance help it achieve a 33 degree approach and a 26 degree departure angle. A locking rear differential provides a huge traction boost for scrambling up steep obstacles and the vehicle’s optional Kinetic Dynamic Suspension System, which constantly adjusts shocks to optimize wheel articulation over rough stuff, is remarkably compliant on-road and off. The Fox shocks equipped TRD Pro may have more travel, but they are locked into the same configuration forever which theoretically gives this “non-Pro” an edge in ride quality on-road. The vehicle’s maximum towing capacity is a modest 5,000 pounds, but 46.3 cubic feet of cargo capacity behind the second row and a roll-down rear window make it a solid hauler if you’re only lugging things that can fit inside the 4Runner. There’s a reason you don’t hear many people complaining that the current 4Runner’s design is almost a decade old. It looks perfectly badass as-is. And the robust chunkiness of the exterior styling carries over inside, too. The cockpit has a very purposeful vibe to it with steep windows, big grab handles and some controls over the windshield. Have you ever noticed how cool it looks to have extra switches over the windshield? The 4Runner rides high, but the vehicle’s overall size feels manageable. Suspension is soft but perfectly viable for on-road driving without wimping out over big bumps. In fact, the 4Runner’s enthusiasm to hop right off the highway and onto the sand might be one of my favorite things about it. The vehicle just feels eager. Long highway slogs aren’t bad, either. Though the 4Runner is not particularly fuel efficient or luxurious, the commanding view you get behind the wheel and militaristic interior architecture make every ride feel like an important mission. The lever-activated transfer case, locking rear diff, solid suspension and roof-console controls all help make the 4Runner a capable and characterful machine, but of course my favorite unique feature might be the disappearing rear window which makes hauling long things, or a dog, or just hanging out in the back of the truck a lot more fun and breezy. The 4Runner’s archaic five-speed automatic transmission isn’t awful, but the fact that Toyota’s OK with a basic box of gears here yet denies us a manual feels a little insulting. In fact, the lack of a stick is the main thing keeping this vehicle the “almost” ultimate SUV. I’m no supply chain executive, but I feel like the 4Runner is actually one of the few vehicles that a large corporation like Toyota could actually justify offering a manual transmission in, even though, yes, only a few of us will buy it. I’m also pretty underwhelmed by Toyota’s infotainment experience. The software skin looks fresh-for-10-years-ago and while that seems to work for the truck’s exterior, nobody wants a retro-looking navigation system. Other than that, I have to say I had a really hard time getting used to the jarringly aggressive initial brake bite. But if you’re looking for an SUV that feels like a truck, it’s hard to find things to complain about with this thing. I already mentioned that the 4Runner’s cab feels tall and tough, which feeds your ego and gives you a little sense of superiority over the dinky cars and crossovers cluttering the road ahead of you. I think that’s the sensation Hummer (RIP) was going for a decade ago, but fortunately you’re in a Toyota now so nobody’s going to point and laugh while you ride by. Unless they’re in a Jeep and you’re stuck in the mud. But I digress. The 4Runner’s off-road tendencies are apparent but not annoying in casual driving–the vehicle certainly rolls and tilts more than you might be used to if you haven’t spent much time in trucks, but as long as you’re not trying to overtake on an onramp or carve Angeles Crest you’re not likely to feel uncomfortable. Similarly, acceleration is adequate but unremarkable. I did find myself testing the seatbelt tensioners a little too often for my liking though, as the damn brakes clamp the rotors far too fiercely with a light tap of the fat brake pedal. Did I mention that yet? I started my off-road shakedown in my own private tornado of sand, whipped up with traction control and the front axle disabled. On a loose surface, the V6 had more than enough power to hold a heathy slide for as long as I wanted to. Hilarity ensued. Just easing off the throttle a little was enough to straighten the truck out and burst clear of my dust cloud, making a heroic entrance into a Mad Max hellscape I was spending my weekend in. Hanging out in 2WD, the 4Runner was more than happy to shake and shimmy its way over the open desert. Another tail-happy turn was just a blip of the throttle away in soft sand, and the suspension was more than happy to absorb the steady barrage of bumps that punctuate most of the trails in Johnson Valley. Engaging 4x4 made the 4Runner infallibly surefooted, and the vehicle felt pretty well unstoppable until I got into rocks. There, I engaged low-range which unlocked a massive boost of torque to the wheels. But while the 4Runner has plenty of power for rock crawling, I found it to be a smidgen too long and low to be able to keep up with my friends in their heavily upgraded off-roaders. I’m told you can still fit aftermarket suspension on a KDSS-equipped Toyota, so a little lift and a few more inches of tire should take a 4Runner from “competent” to “crushing it” off-road should you so desire. Down scary-steep hills, the 4Runner’s terrain-responsive off-road cruise control (Toyota calls it Crawl Control) made a lot of noise but was extremely effective at managing the vehicle’s speed. It goes a long way in idiot-proofing your off-road ride, basically all you need to do is steer and the truck will hold your hand down big drops at a walking pace. You’re looking at about a $40,000 MSRP for this version of the 4Runner, which is a sizable amount of money. 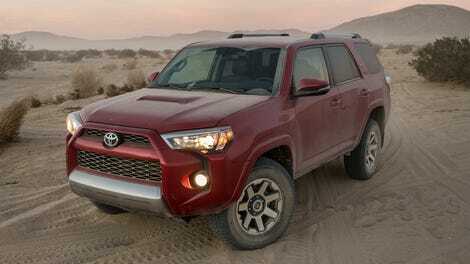 But like its stablemates the Land Cruiser, Tacoma and Tundra, used 4Runners tend to stay expensive. That means buying a new one isn’t too bad of a proposition compared to a lot of other cars. As for alternatives, the only other stock SUV that really offers this much earnest off-road ability and attitude out of the box is the Jeep Wrangler. 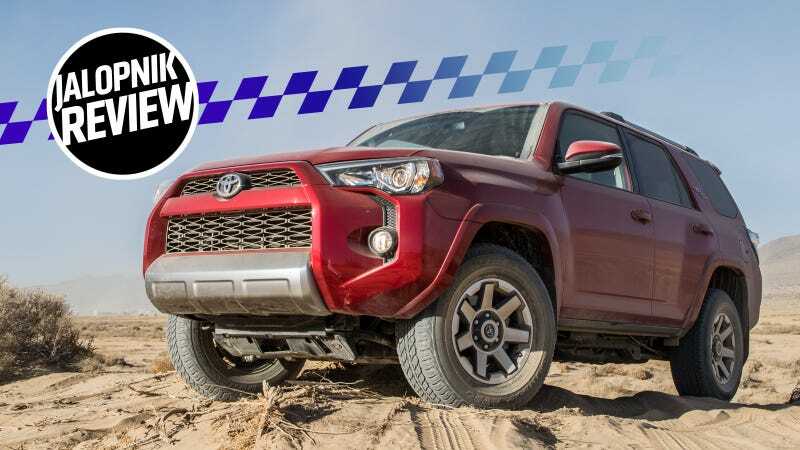 Those also hold their value well, but I feel like the 4Runner’s independent front suspension might make it a bit better ride on-road and at higher speeds. I also happen to find the Toyota a little more refined inside, even compared to the revised-for-2018 Wrangler. Then again, you can’t get a 4Runner with removable doors, windshield and roof panels. Or, as I mentioned, a manual transmission. The 4Runner looks cool, has the necessary capability to stand behind that styling, a solid track record for reliability and huge off-road aftermarket support. And despite its thirst for fuel, it’s a far more livable daily driver than an off-road 4x4 has a right to be. But more importantly, the 4Runner has something precious few 2018-model vehicles can claim: personality. The truck feels lively, communicative and just downright good-spirited. The look of the cab and feel of the suspension just exude adventure. You buy a truck like this because you want to mount your own epic expeditions. You’ll keep it because every trip to the store feels like one. Just a manual shifter shy of adventure-vehicle perfection.